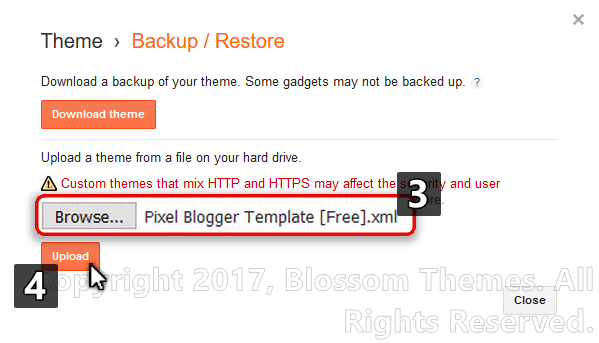 Go to your blogger dashboard and inside the template tab click on Backup/Restore option located at top right corner. 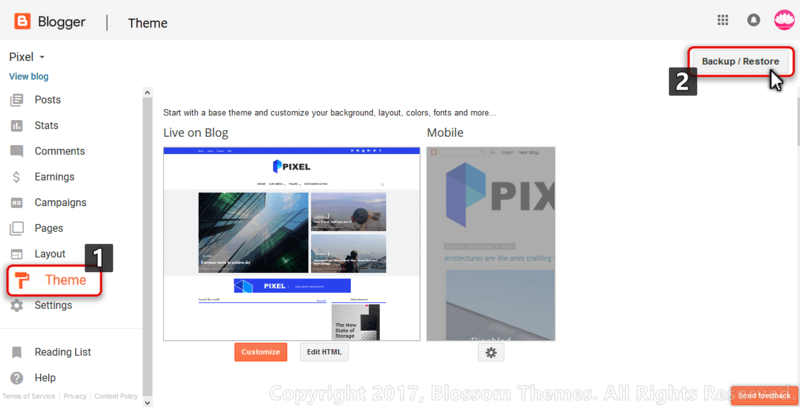 Now click on the browse button and select the extracted template file,Pixel Blogger Template.xml. Now click on the upload button. After installing click on the "gear icon" in the theme section and select "No. Show desktop theme on mobile devices. " and click on save. Login to your blogger account and go to "Layout" tab. In the layout tab, look for the Blog Logo and click on "Edit". Click on the "Browse" button and select your respective logo. Select the option " Instead of title and description"
Now click on the save button and also click on "save arrangement" button at top right corner. In the layout tab, look for the "Top Menu" widget and click on "Edit". In the input for "New site name" type the name of your link. 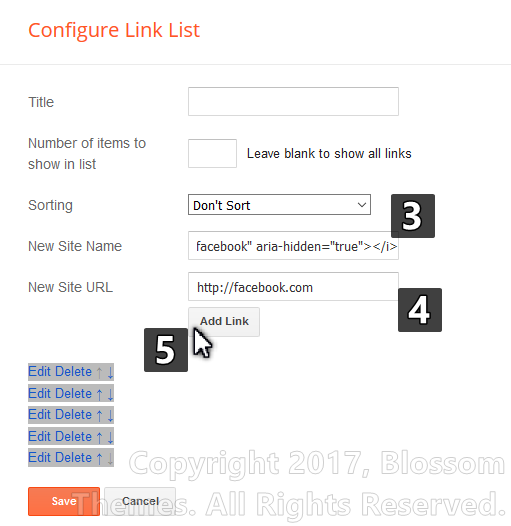 In the input for "New site url" type the location of your link. Click on "add link" button as show in in image. Arrange the links as per your need by the up-down arrows. Click on save button. In the layot tab, look for the "Top Social widget" and click on the "Edit". In the input for "New site name" type the name of social media. 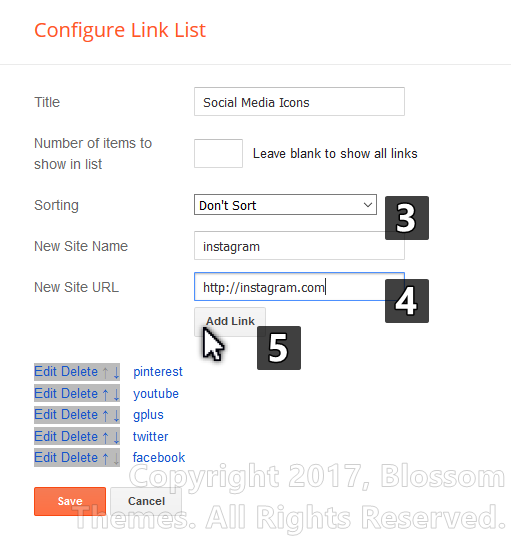 In the input for "New site url" type the location of your social media profile. Now click on the "Add link button" as shown in the image and click on save widget. 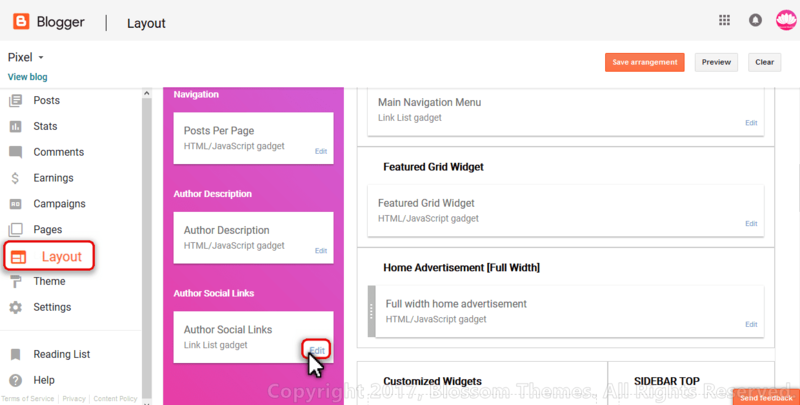 In the layout tab, look for the widget "Header Ads" and click on "Edit". In the content area place your advertisement code. Login to your blogger account and go to the "Layout" tab. In the layout tab, look for the widget "Main Menu" and click on "Edit". 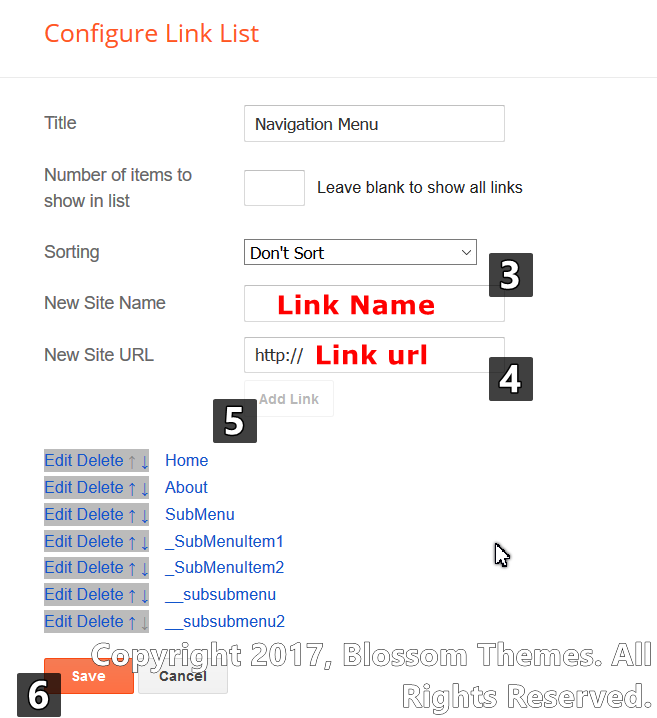 In the text input of new site name enter your Link name. 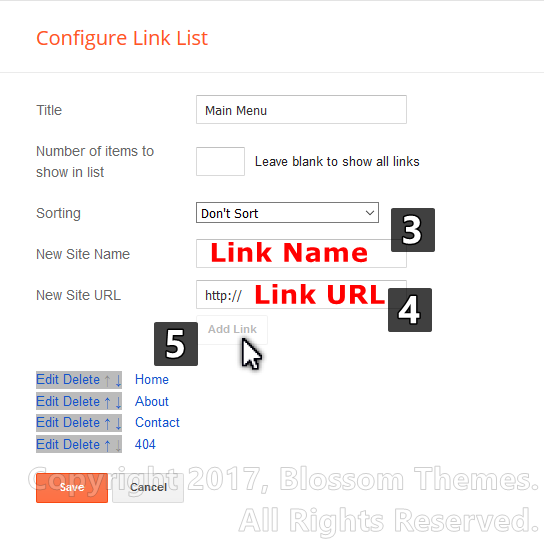 In the text input for new site url, provide your link url. Now click on the add link button. For the SubMenu add "_" (One underscore) before the name of the link. For the Sub Sub menu add "__" (Double underscore) before the name of link. 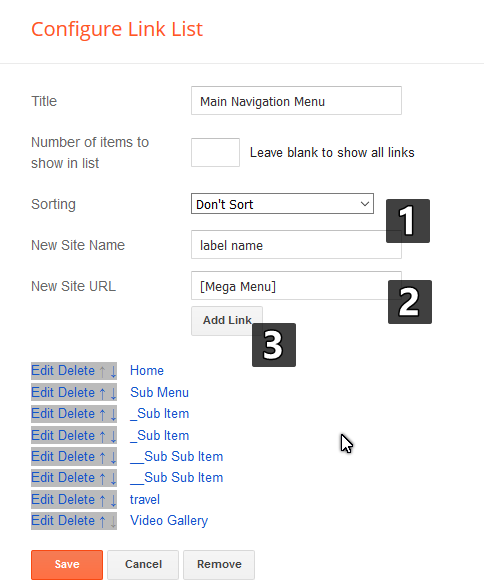 For setting up the Mega Menu in the input for new site name insert the label name for which you want to show the mega menu and in the input for url add "[Mega Menu]" as shown in image below. Save the widget and the layout arrangements. In the layout tab, look for the widget "Featured" and click on "Edit". Now click on save and save the arrangements. Pixel theme comes with the 2 customized widget, to setup them go to the "Layout" tab. As per your layout decision add the respective code in the content area of the "HTML" widget. Change the text in red with your label and click on save widget. Pixel Themes come with the different sidebar widget options. To setup them go to the "Layout" tab. As per your requirement add the respective code shown in the table below. In the layout tab, look for the widget "Comment System" and click on "Edit". In the content area place the respective code for the combination of comment system from the following list. In the layout tab, look for the widget in the admin bar, "Author details" and click on "Edit". In the content area place the description about author which will be shown at bottom of post. In the layout tab, look for the widget in the admin bar, "Post Author Social Profile" and click on "Edit". 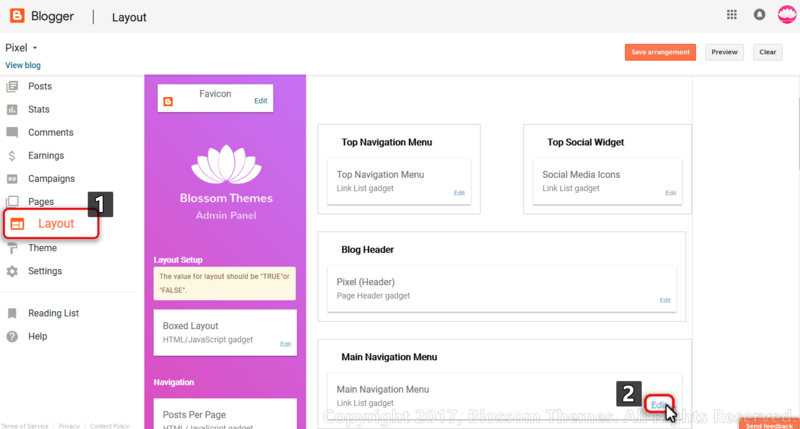 Now in another window open the link http://fontawesome.io/icons/ and search for your social media icon and click on them. 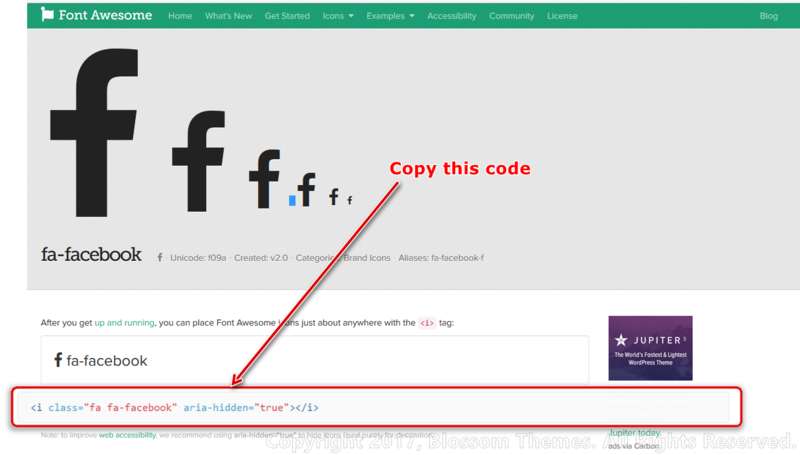 In the new window copy the code shown in the image below. Now go back to the window open earlier by clicking on edit button. In the input for "New site name" place the code we just copied. In the input for the "New site url" place the location/profile url for the respected icon. Now click on add link button. Once all icons are added click on save. In the layout tab, look for the widget in the admin bar, "Posts per page" and click on "Edit". In the content area place the number of posts you want to show on each page. 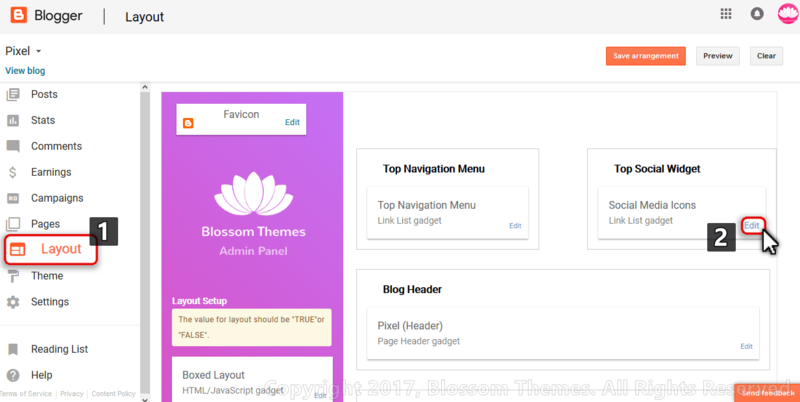 Login to your blogger account and go to "Theme" tab. In the Theme tab, look for the "customize" button and go to the "Advanced tab". In the advance tab under the option of Main Setting you can customize the main color of theme. Now click on Apply to Blog. olá, o pixel-widget não está funcionando. 2. 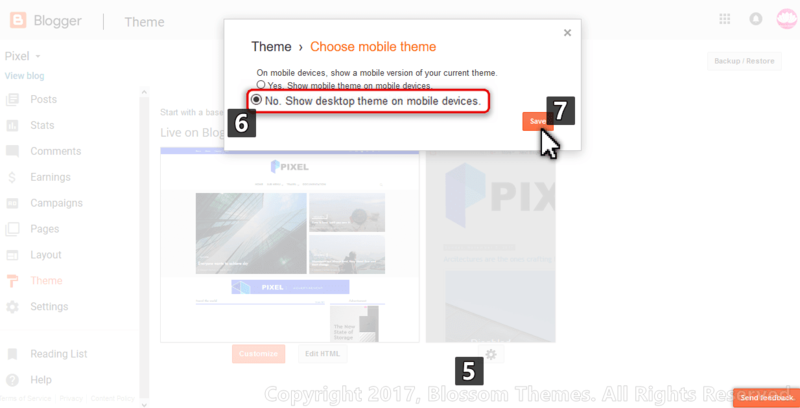 Can I change the photo in the top header of a POST to another photo instead of the first photo of the blog post? 3. How do I remove photo in the top header of a PAGE? I am trying to display ad with code but its not showing up! Only the title is being visible. Image is not displaying, why? 2- find designed by and change it with own. I hope, it'll helpful for you. Hi please help me why Setting Customized Widget. point (8). not working when I put my label. Thanks so much colorlib, you guys have done what seems like impossible. Thanks a bunch! thanks for this useful blog. I am trying to add my own ads to the page. I tried to to share an animated html from google drive and onedrive however it does not display on the pages. Then I tried to do same with gif, it show the background image but does not run. Is there anyway I can get it to work? Hello, post-head is not working. 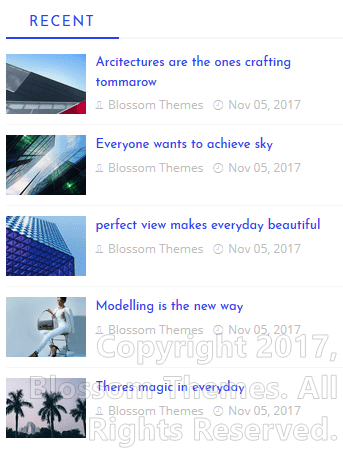 when some try to visit an individual page, page come without title and title image. After that I try to see the demo (https://pixel-template.blogspot.com/2017/11/arcitectures-are-ones-crafting-tommarow.html) and found same issue. (Sample screen shoot - https://drive.google.com/open?id=1W6FTSxj7wgO0jda0ZQsdQAw9UEwA7YM1) where it should show like this https://drive.google.com/open?id=1D8Lf4nfI1JhibhFXnrngp4Yjc42XZSNy. How to solve this issue?? Please help me how can a i add two diferents labels in the featured widget? 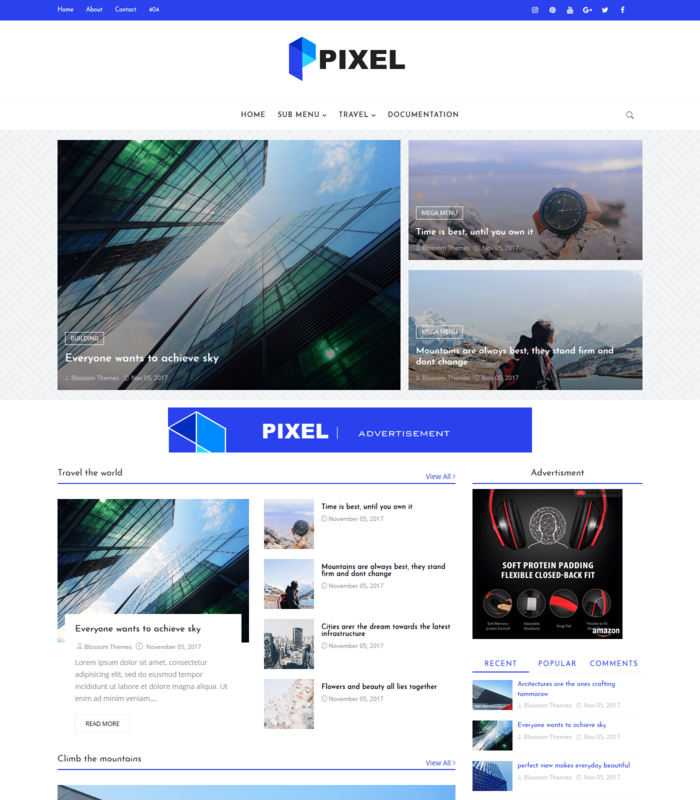 Copyright 2017, Pixel Blogger Template Demo. All rights Reserved.